For spring and summer, this honey-based cocktail can strike just the right tone: a light buzz. 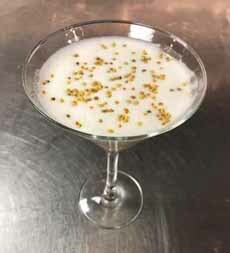 We adapted it from the cocktail of the month, called Two Bees Walk Into A Bar, at Davio’s Italian Steakhouse in New York City. It uses an easy-to-make honey simple syrup, infused with rosemary, that you can use in other drinks as well. A recipe for a Honey-Rosemary Martini is below. *If you’re concerned about raw eggs, get pasteurized raw eggs. 1. MAKE the simple syrup. Combine the water and honey in a small pot over medium heat and whisk until the honey dissolves. Add the rosemary and cook over low heat for 30 minutes. Remove from the heat; cover the pan and refrigerate for at least 30 minutes, until cool. Strain and discard the rosemary, and store the syrup in an airtight jar. 2. COMBINE the other ingredients (except ice and garnish) in cocktail shaker and shake vigorously for 30 seconds. Add the ice and shake for another 30 seconds. 3. STRAIN into an 8-ounce glass (the photo shows a large Martini glass). Sprinkle with bee pollen and serve. 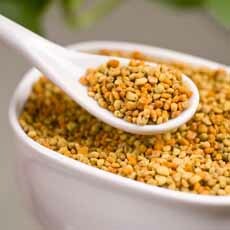 Bee pollen is made by bees as food for their young. It is considered one of nature’s most completely nourishing foods, containing nearly all nutrients required by humans, including approximately 40% protein. For this reason, it is a valued nutritional supplement, but has also become fashionable as a garnish. Consider this a most nutritious cocktail. A honey of a cocktail, from Davio’s Manhattan. 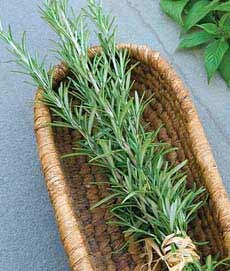 Fresh rosemary (photo courtesy Burpee). Bee pollen. Here’s more about it from Shape Magazine. You can make a sweeter cocktail with a bit more simple syrup (proceed cautiously); or a less sweet cocktail by adding more vermouth. 1. ADD 6 ice cubes to a cocktail shaker, followed by the other ingredients. 2. SHAKE vigorously and pour into a Martini glass. Garnish with fresh rosemary.